RESIDENTS of Christmas Hills have had their concerns heard regarding the consultation process around the Melbourne Water land disposal with Lisa Neville, Minister for Water calling on Melbourne Water to extend their consultation period. As reported in the June Diary, the community are concerned that Melbourne Water is taking a short-term view of the divestment of 1,000Ha of land being sold off, now that the decision has been made not to construct the Watsons Creek Storage Reservoir (WCSR). Melbourne Water met with residents in May seeking community input into how the land should be configured and which zoning would be most appropriate for the land. Local residents and representatives of the Christmas Hills Landcare Group, Veronica Holland and Doug Evans spoke with the Diary and said that the consultation since the May public forums and their subsequent Melbourne Water Options Development Report — Christmas Hills Land Use Study (ODR) has been non-existent. “Just deathly silence,” said Ms Holland. However, she said that Nillumbik Council has been put in a “wonderful report that just outlines all the planning regulations that don’t seem to be mentioned in Melbourne Water’s report”. “It starts off by saying that the land can only be sold once, so you have to be sure that the use of the land before you sell it is what you want it to be into the future,” Ms Holland said. The Council’s Draft Assessment report highlights what it says are a number of deficiencies that are evident in the ODR. When the document was tabled at the Nillumbik Futures Committee meeting, the Council heard how the “ODR outlined the key considerations that have informed the development of the, largely residential-led, land use options proposed for the ‘study area’”. “Council’s draft Assessment Report highlights concern with the lack of evidence to demonstrate how Melbourne Water has considered and is seeking to implement key State Green Wedge policies and objectives. “Further, there are a number of statutory planning concerns about implementing the residential outcomes shown in the ODR” the meeting’s minutes note. Nillumbik Councillor Jane Ashton spoke to the Diary at the time of the July meeting and said that Melbourne Water need to “look higher-level, they have to look to what the State Government is saying about Green Wedges moving into the future. “We think what they have done is pretty simplistic, if they define ‘best use’ basically meaning how many residential blocks can you get in there, we think ‘best use’ is not that, it is preserving Ponylands and Wanneroo and Rob Roy. “How do we protect the potential for agriculture and contributing to Melbourne’s food bowl for the long term? “How do we protect what community values here in the long term? “Whereas Melbourne Water ’s approach, from our increasingly cynical point of view, has been a shorter term, ‘what is in it for us quick, which is how do we get more houses in there and make more money’,” he said. He and Ms Holland say the current community have a feeling of stewardship over this place, “it’s not something to be exploited, it is something to be appreciated and protected forever”. “Chop it up and put a house on it and you have lost that potential forever, keep it as big as possible and use it in ways that don’t preclude agriculture in the future is much better,” he said. Sally Brennan is the Labor candidate for Eildon, which includes Christmas Hills, in the forthcoming State election. Ms Brennan has met with local residents and raised the community’s concerns directly with the Minister for Water and she is calling on Melbourne Water to engage further with the community to understand these views. Ms Brennan is calling on Melbourne Water to take a long term view within the context of what is best for Christmas Hills, what’s best for the environment and what is best for the long term future of the land. Liberal Member for Eildon, Cindy McLeish told the Diary that the Andrews government is “hell bent on selling land in order to pay for big infrastructure projects in the city”. “Those land sales, and the potentially inappropriate development that follows, pose a big risk to the amenity of our local area”. She said that she had called on the Minister to ensure that Melbourne Water conducts transparent and robust community consultation to ensure local resident’s views are incorporated into the development of a Master Plan for the Christmas Hills land. “I was concerned that only two options were put to the residents when in fact the consultants had developed three options,” she said. Minister Neville has told the Diary that this is a “once in a generation opportunity to protect and enhance the environmental and community assets of Christmas Hills by identifying options for the disposal of land in the area currently owned by Melbourne Water”. “As part of this process, we want to ensure the community’s voice is heard on the Master Plan for the area, so I’ve asked Melbourne Water to extend the independent assessment following concerns raised by community members,” she said. A spokesperson from Melbourne Water told the Diary they are continuing to review the range of feedback that has been received related to the draft Master Plan for land in the Christmas Hills area. “We recognise that, while we have undertaken significant community engagement and consultation, some concerns remain. The spokesperson said “as a first step, we are working closely with Nillumbik Shire Council in response to their detailed submission to our draft Master Plan and considering the importance of this process, we want to allow appropriate time for these discussions”. Melbourne Water has said it will provide the community with another update later in the year and is “currently looking at further opportunities for stakeholders and the community to engage with Melbourne Water” before the draft Master Plan is finalised. Mr Evans says that more consultation in itself is not the complete answer. “It is not just more consultation per se, I think we would only be interested in more consultation if there was a genuine shift in focus to the long term view. “We need to see the current position, has it changed from what has been presented to us previously, if it hasn’t changed there is not a lot of value in meeting again to say yes there is no change,” he said. “We want the end result to reflect the principles of the Green Wedge, it should be in the largest lots possible under the Green Wedge provisions because now that it is public ownership, one ownership, they can address the problems of small lots within the Green Wedge by consolidating them, and if you do that you have basically created, or preserved, what is this unique place close to Melbourne,” said Ms Holland. 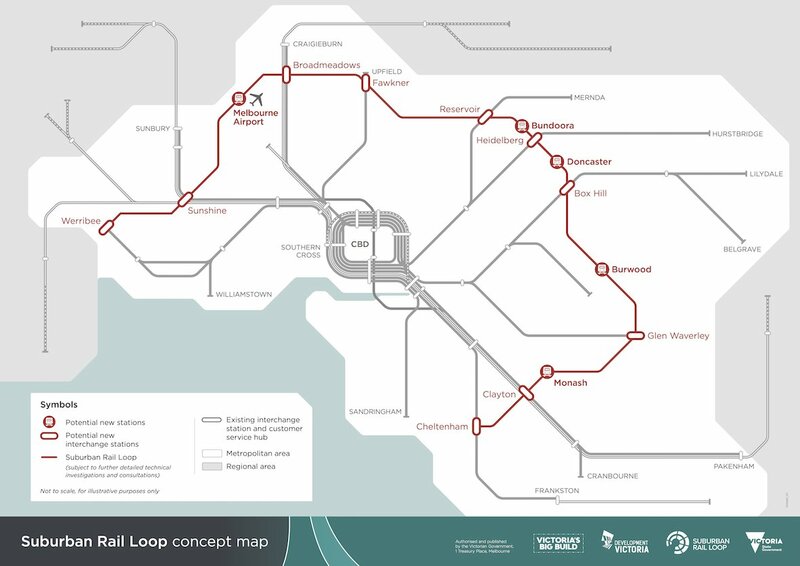 Ms Brennan said: “it is very much the context of the consultation…which is what is best for the future, what is best for the community, what is best for Christmas Hills, what is best for Melbourne”. “This is a unique opportunity to look at a piece of land that we as Victorians, and certainly as residents of Christmas Hills, seek a stewardship role over to protect for the future — not a short term solution, one that gets rid of the problem for Melbourne Water. “For a whole range of reasons, there has been a disconnect between the process that Melbourne Water has undertaken and those long term aspirations of the community — so what we need to do is bring it back together — it needs to include a much more broad-ranging, longterm solution, that includes the expectations of this community, which are about protecting the Green Wedge, protecting the integrity of that land. “This is a rare opportunity to do something important and valuable and in fact to make it better than it was,” Ms Brennan said. Earlier today, the Police detonated a homemade explosive device at a bus stop in Park Road, Park Orchards. In the early hours of the morning on 9th October a small and unsophisticated home-made explosive device was detonated at a bus stop in Park Road, Park Orchards. No persons were injured and the bus stop sustained minor damage only. Police believe this to be an isolated incident designed to cause damage to the bus stop but advise that home-made devices such as this are dangerous and have the potential to cause serious injury. Anyone locating an unidentified or suspicious looking device should leave it undisturbed and call 000. Police would like to hear from anyone who saw any person or vehicle in the vicinity of 605 Park Road, Park Orchards, between 2.30 AM and 4.30 AM on 9th October 2018. 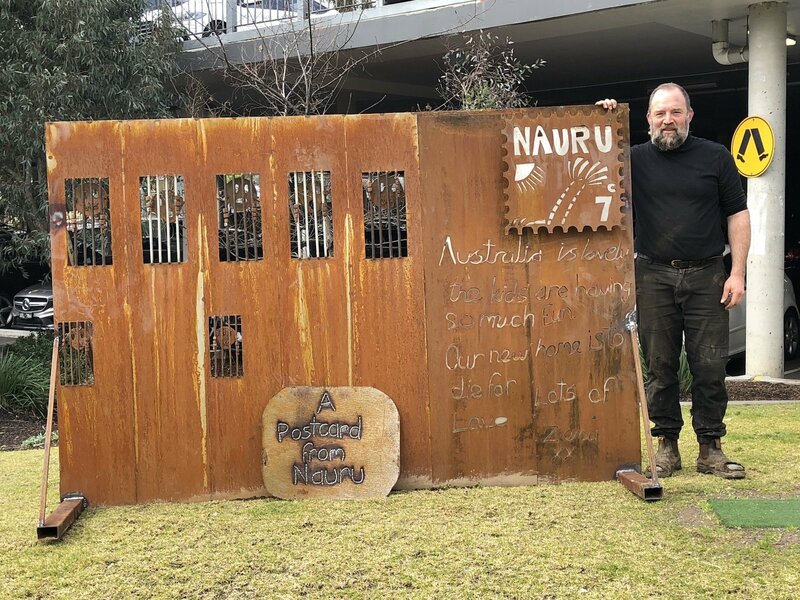 LOCAL ARTIST Tim Read has been driven to protest the treatment of refugees on Nauru, and he has done it through the medium of sculpture. “Our government has been fighting in the courts against bringing sick children into this country — and when they are finally ordered to bring them to the mainland these kids are at deaths door,” he said. Tim said he felt for the children suffering from a syndrome where they are uncommunicative and not eating, because they are being held in detention with no hope of release in sight. “I was so frustrated that our politicians are doing this, and I thought ‘what can I do?,’ well I can do something at least through my artwork,” Tim said. 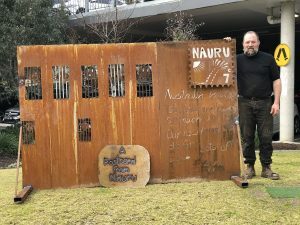 So, following his epiphany, Tim stayed up late into the night and produced A Postcard from Nauru, which he installed at Eltham Square in late August. “Within a couple of hours of it going in people had started to put cards and flowers around it,” he said. Not everyone was pleased about the installation, Tim’s Facebook page, Tread Sculpture receiving angry messages outraged at his protest, and other’s using the installation to refute Tim’s claims of ill-treatment. Tim said that while he didn’t agree with the sentiments expressed and unhappy with his work being hijacked, the person still had the right to put the poster there. “That’s the whole point of free speech, but do it with your own artwork, not mine,” he said. Council also received calls about the work. While the Council were very supportive of his protest, Tim has now removed the work from the site, and is considering his options about installing it in another location. BEND OF ISLANDS artist, Tim Read of Tread Sculpture was pleasantly surprised by a phone call he received a couple of months ago to commission a work for the remote Aboriginal community of Mapoon in Far North Queensland. “I was staggered when I looked up where Mapoon was,” Tim told the Diary. The tiny community of around 250 people, only 200 kilometres from the tip of Cape York, is about as far as you can get from the Bend of Islands, but the community felt a connection with Tim’s work and commissioned him to produce an artwork for their up-and-coming Paanja Festival. “The CEO of Mapoon Aboriginal Shire rang me to say they were having a celebration in September and they would really like some steel sculptural works representing the township and she found me online, ‘am I interested?’— and it went from there,” Tim said. The remote community initially invited Tim to go fishing with them in exchange for his artwork. “It sounded like a great plan, except I have got to make a living from my artwork,” he said. “My artist friend who had done work with communities up there, Linda MacAulay, told me that ‘life is simple up there, you enjoy the fishing and the hospitality and that’s the way it works’,” he said. A more traditional payment was eventually negotiated for the commission. 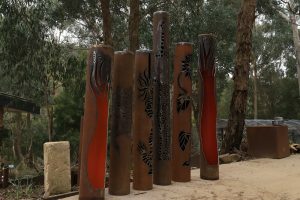 Tim was shown a painting from local indigenous artist to inform his sculpture, which he has developed into a series of five totem poles that reflect the local Indigenous art, culture and landscape. Tim works with reclaimed material to produce his sculptures and the rusted metal aspect of his work, along with Tim’s representation of native plants and animals, proved to be the right t for the remote community. The sculptures are currently making the long journey to Cape York and, after being unveiled during the Paanja Festival, will stand as part of the gateway to the community. If, dear reader, your travels take you to this far-flung community, keep an eye out for this little piece of Warrandyte in Cape York. More than 400,000 people are living with dementia in Australia and an estimated 70% of those people are actively living in the community. get involved in Dementia Awareness Month this September to help improve the lives of people living with dementia, their families and carers. Council are encouraging residents to learn a little more about how we can better support family, neighbours, friends and people in our networks impacted by dementia. It is an important step to help reduce stigma and dispel some of the common myths about dementia. Many conditions have symptoms similar to dementia so it is important not to assume that someone has dementia. that the correct advice and strategies are provided to manage the condition. Manningham Mayor Cr Andrew Conlon said Manningham would be highlighting the small actions our community could take to create a big difference for people living with dementia. “We’re inviting the community to show their support by becoming a Dementia Friend to increase understanding about the condition,” he said. A dementia-friendly community recognises that a person with dementia needs to continue to participate in the community; this can include employment, volunteering or social activities. is running a number of workshops and resources for people and families impacted by dementia, as well as the wider community. Cr Conlon said through increased awareness and support, Manningham hoped to make a positive difference to the lives of people living with dementia. “We aim to transform the way we, as a community, think, act and talk about dementia,” he said. Manningham will also be releasing a pocket-sized set of information cards with up-to-date information about dementia; this includes a list of reputable organisations the community can contact for further support. Council, in partnership with Dementia Australia will be holding an interactive seminar for Dementia Month: Worried About Your Memory on Tuesday, September 18 at Manningham Civic Centre.